A thing of grace and triumph. Here is a movie that’s already getting lots of Oscar buzz, and you know why? It deserves it. This is the best movie I’ve seen this year, or in a couple of years. It is not only deeply moving, but also beautiful to behold. From a killer cast to eye-catching cinematography to lush atmospherics, this it the movie that sets the high water mark. This is not just another “Rocky” movie, rather this is a film where grace overcomes judgment, encouragement overcomes criticism, honesty overcomes fear. And in the end, courage overcomes doubt. The story is based on 20th century history, though it is perhaps unfamiliar to Americans. Prince Albert, the Duke of York is second in line for the throne of England behind his elder brother Edward. 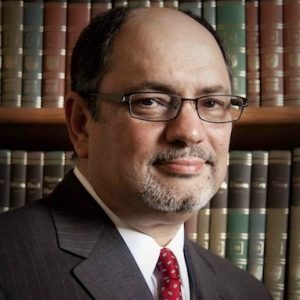 In some ways, like Henry VIII who also was second in line behind his brother, the younger brother distinguishes himself in another area of endeavor. With Henry, he went off to seminary and studied theology. Albert became a naval officer. 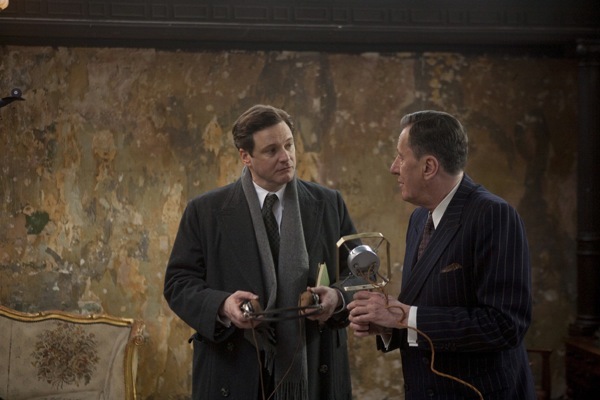 But a crippling stammer paralyzed Albert (Colin Firth) when he needed to speak in public. A series of doctors unsuccessfully attended him before he met the unconventional therapist, and unsuccessful actor Lionel Logue (Geoffrey Rush). 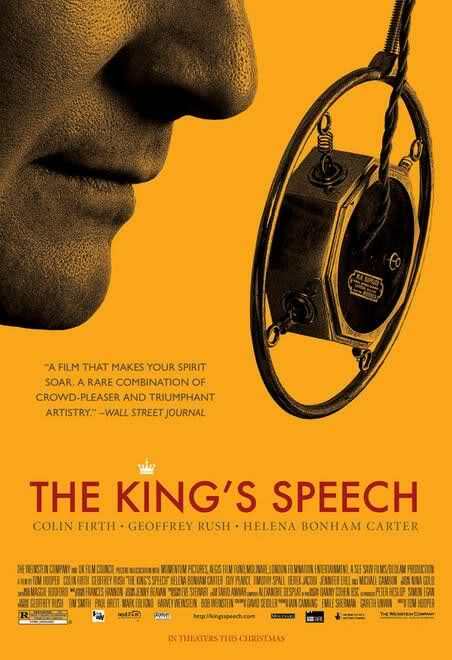 The movie culminates, not surprisingly, in the King’s Speech where the recently crowned Albert, now as King George VI addresses the nation in support of the declaration of war against Nazi Germany. 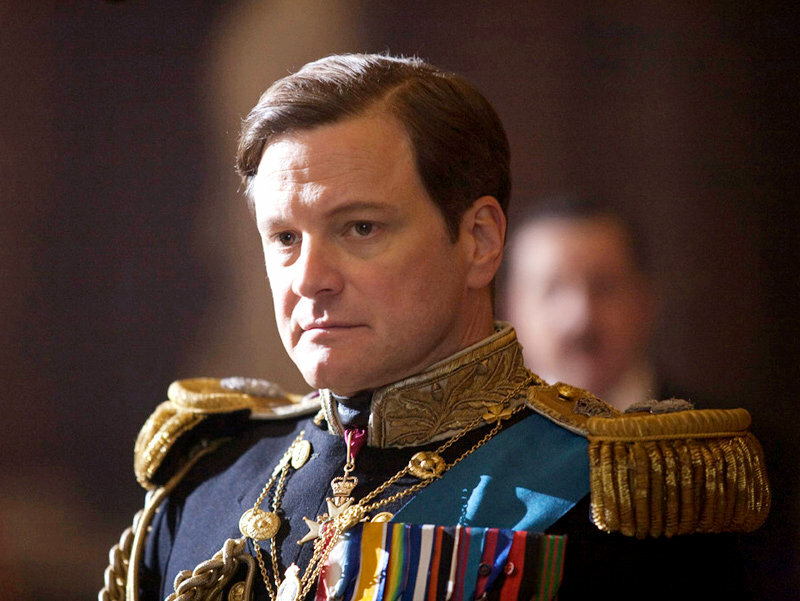 Colin Firth is often cast as an attractive and sophisticated Brit. Many on this side of the Pond met him in the 6-part 1995 BBC miniseries “Pride and Prejudice” where he played Mr. Darcy. Or in the “Bridget Jones” movies where he played a parody of that character. Here he’s cast as a self-doubting royal who does not long for the throne, but finds that the untimely departure of his elder brother forces the crown upon him in the midst of great national crisis. This performance is one of Firth’s best, following on the heels of last year’s strong performance in “A Single Man,” seems to hint at Oscar gold this year. Geoffrey Rush is best known recently as the villainous Captain Barbossa in the “Pirates of the Caribbean” movies. He handles comedy as deftly as drama and when he appears on the screen, the magic begins. The way he interacts with the Colin Firth is amazing, and his unexpected familiarity with the Prince evokes such delicious humor, honesty, encouragement and sheer pathos, I would not be surprised if Oscar pixie dust gets sprinkled upon him. A tour de force performance — as the first man who brought the future King confidence, grace, affirmation, and a belief in courage in the midst of a heavy burden — made this film so palpably powerful. Playing the role of a sure-of-himself Australian — Rush actually is Australian — inspired and encouraged “Bertie” in the unfolding drama of his brother’s abdication and his own coronation. Helena Bonham Carter, as the devoted and compassionate wife and Queen Mother of the current Queen Elizabeth II, shone in a role otherwise too small. She conveyed the look and practicality of the future Queen Mum and added a charm and humor that both brought notice to and excused commoners’ bedazzlement with royalty. The actress first splashed upon the American consciousness was in the Merchant Ivory “A Room With a View” but is most recently know for her role as Bellatrix Lestrange in the “Harry Potter” movies. Jennifer Ehle plays Myrtle Logue, the wife of Lionel (Geoffrey Rush) who adds some simultaneously hilarious and surprisingly touching moments when she finally meets the King when he’s visiting her house. Most Americans know Ehle as Elizabeth Bennet in “Pride and Prejudice” where she played opposite Colin Firth. When she meets him here briefly as King it is a curious home coming. I caught her 5 years ago at London’s Old Vic Theatre where she played the lead role of Tracy Lord opposite Kevin Spacey in “The Philadelphia Story” when I got to meet her even more famous mother Rosemary Harris in the audience. It inspired me to begin my blog on theatre/movie/concert reviews, CultureVulture. with my first review of that performance. Derek Jacobi plays the Archbishop Cosmo Lang, who in this film is almost condescendingly articulate. But ironically, the actor first became known to Americans via the British import “I Claudius” where he played a stammering member of the Julio-Claudian dynasty who survived the imperial infighting to become Caesar. Guy Pearce as King Edward, known to Americans in the film “L.A. Confidential” and recently in “The Hurt Locker,” previously streaked across the screen in the time-bending film “Memento.” Here he plays the role of an attractive, well loved, yet ultimately selfish royal who would abdicate for the love of a twice-divorced American commoner. The cinematography was stunning, and without the use of obvious special effects. The camera angles, the framing of the characters, the use of fish-eye lenses to convey a sense of overwhelming pressure — all these contributed to the luxurious feel, the fit-and-finish of the film. The lush soundtrack was by Alexandre Desplat who recently did the music for the latest “Harry Potter” film as well as “The Social Network.” He also did the score to the 2006 film “The Queen” about Elizabeth the daughter of King George VI. “The King’s Speech’s score featured extensive piano solos, and music by Beethoven, Brahms, and Mozart. It too has Oscar pixie dust on it. It was recorded at Abbey Road Studios in London. The most remarkable part of the score was during the climactic King’s Speech itself, with the awesome and powerful Symphony No. 7: Second Movement by Beethoven. You may remember the brooding theme in “Zardoz.” Here it begins slowly, as does the King’s Speech and builds with urgency and confidence. I’ve not been moved by movie music as powerfully since “Chariots of Fire.” Nor has any movie since been so inspiring by the triumph over seemingly insurmountable odds through the grace of a friend who expresses such faith. You’ll like it if: you’re an Anglophile, dig period costume pieces, are fascinated by British Royalty, appreciate darn good acting. You won’t like it if: you don’t care for swear words (part of the speech therapy) that earned this an R rating, prefer action over words, or if you’re still holding a grudge against the English since the Revolutionary War. This is one of my favorite movies of the year and I believe will win at least one Oscar for Colin Firth, but gets my vote for best picture and supporting actor for Geoffrey Rush. To take a very austere subject and present it in such a compelling way is masterful. It is amazing to leave the theatre and realize that you became caught up in the story and bodily tense waiting for the climatic scene as if you were watching the latest over-the-top action movie. Public speaking can be terrifying and we all identify with this part in a very visceral way. Add to it the psychological thorns that crush any desire one might have to trade places with a member of the royal family and you have a genuine hero tale from a very atypical perspective. This is also the first movie ever that my wife says the language is completely appropriate (and she believes Rhet Butler’s should have chosen his words more wisely).